Q:Will it allow to record on network attached storage disk NAS? Yes! Though not well documented by Samsung. 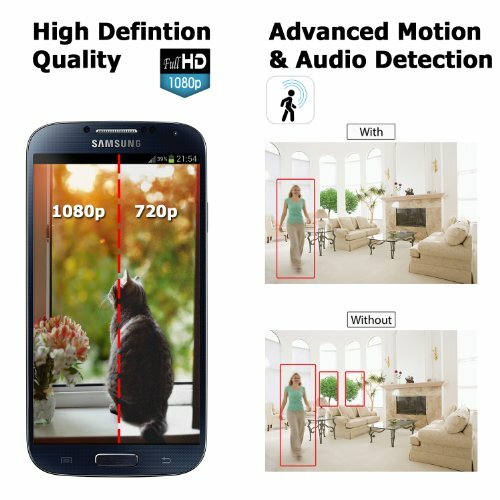 Like all Samsung SmartCam models, in your Network Video Record (NVR) camera setup, use RTSP H.264 to receive video streams. BTW, you don’t need a physical NVR machine. You can download Samsung’s own NET-i ware NVR software at http://www.samsungsecurity.com/product/product_list.asp?cid=45&clvl=1. To set up in Samsung NET-i NVR software or other software or physical NVRs, follow these steps. 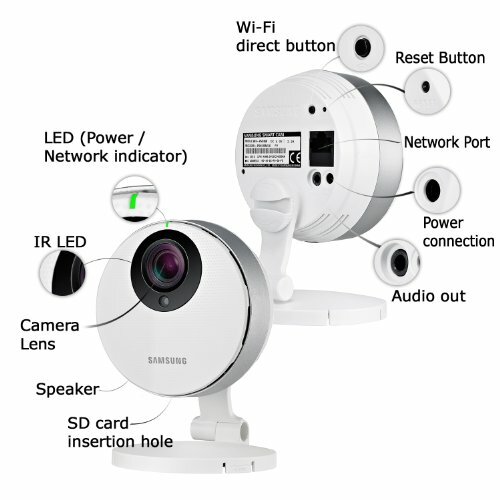 Select Add Camera > Register Device (Manual – Do not auto detect) > Select Vendor Name = Samsung, Model Name = Samsung Network Camera / Encoder, Address Type = IP Address (To reduce unnecessary traffic and network security risk, use your internal network address, not your external ip address. ), HTTP Port = 80, Device Port (Or, Media/Video/RTSP Port) = 554, Login ID = admin, Login Password = (Your Camera Private Key when you registered your camera at samsungsmartcam.com, i.e., when you first set up the camera). Note: When setting up the camera, the vendor name and camera model info are informational only. Only RTSP Protocol and ports, login credentials are critical. Here is an example of setting up Samsung SmartCam with Blue Iris Software NVR. The instruction is for the older model SNH-1011N. However, everything still applies to the newer SNH-P6410BN. Q:Is it possible to disable the IR Led’s? Yes, “Night Vision” can be turned off from the SmartCam website. Login and select the camera, bottom left side click on Settings icon, towards the right side Night Vision can be turned On/Off. Q:Is there an Iphone / Ipad App for this system? Q:While the product info states it will work with a Chrome browser, will it work with a 4G equipped Chromebook – versus tablet – as a remote monitor? The samsung smartcam website webviewer plugin isn’t chromebook/chrome compatible – can anyone help? Q:I want to use 2 cams for ‘live’ view out my front and rear windows. How do I dsiplay both cams simultaneously on one monitor? You can download Samsung’s own free Samsung NET-i Viewer Software to manage and view up to 64 channels. NET-i allows display side by side. It can be downloaded from samsungsecurity.com. Q:Can I view live or even SD card recorded video directly from the local IP if my WAN is down if I am on the same LAN? At the moment Samsung has not provided to see the recorded video from local network. SD card can be taken out and viewed directly from the computer if needed to, but you will need to know the time and date you are looking for. Q:Can this be used outdoors a a front door monitoring camera? The shell is plastic and the camera is very sensitive to light. I had it monitoring my front porch and in the afternoon the sun hits the lens and created rings and rainbows on the video. I am now using a dropcam hd at the front door and it seems a little less sensitive. I have it mounted against a window inside looking out. The bad thing is recording on the dropcam must be subscribed to for 9.95 a month and the smartcam uses an internal sd card. I’m trying to find a location facing north so I can put the samsung to good use. I would not mount it outside nor would I mount the dropcam outside either. Q:What is the duration of the video that’s recorded on the MicroSD card by motion or sound events? Is that something the user can set? For motion detection, most clips I’ve viewed range between 30 to 90 seconds. I turned off audio detection, so can’t comment on that. I haven’t seen a feature offered by Samsung where user controls length of motion recording, it stops on its own. In my few months experience, I’m only aware of users having one of two choices: record motion detection clips only or 24/7 continuous video. The time depends on the size of your card and the settings (constant recording vs event recording). Once the card is full, the camera will overwrite the oldest video if you setup your camera camera to do so. Q:Is it true that playing recorded event is only at 720p? 1080p is for live viewing only? Yes. The camera records in 720p @15fps. 1080p live video streaming is only available from a computer Web browser. Q:If using this to hear a baby cry does the sound still work once your phone or iPad goes to sleep? Yes, it works just like when getting notifications like sms etc… it will make a sound. Q:Can feed be viewed live on a Samsung Smart TV via same network (ie, tv upstairs, camera downstairs) in addition to the Smartphone? Once its Smart TV Yes you can sync the camera and watch live events. Q:does it tilt and pan? How long is the power cord to the camera? The camera is fixed camera, but has an ultra wide angle so you can view the whole room. Since this is HD camera, you can use pinch-zoom from your mobile device and use your finger to move around the screen. The power adapter is abut 8ft long. Q:Can you monitor the video directly over LAN, using a desktop video player, instead of using a browser and going through Samsung servers? yes you can use direct IP to the camera. 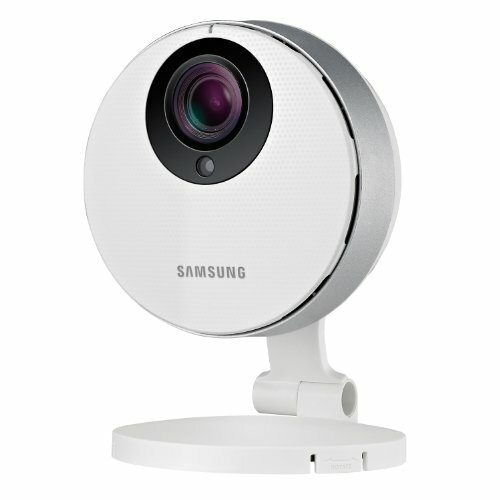 Q:Does the camera function as an IP camera independent of the Samsung Server? Yes. You can log into it with a browser by going directly to its IP address. Q:what is the maximum micro sd card that I can put in the cam ? 64GB is the max that it can hold. According to the the manual available online, the maximum capacity microSD card that the camera can handle is a 64GB card. The AC cord is approximately 8 feet long. Q:Can this camera be wall-mounted? Yes. The swivel plate adapter has holes in it for mounting in the wall. Q:Can this save motion footage automatically by gmail or cloud? Yes, you can save footage on micro sd card for up to 24 hours or as a motiion alert that will go to your gmail account. Q:Is this a good choice to use as a video baby monitor? To follow up on my “yes” response, it should be a very good baby monitor. Daytime video quality is good to great depending on resolution selected. Night vision is above average for a security camera. But compared to a few baby monitors I’ve seen on YouTube and from friends/relatives, it’s definitely better than those. It has a speaker and mic, but don’t expect to have long conversations through it, delays in audio. But it should be fine to speak into if you want your baby or child to hear your voice and comfort them at night. For more detailed info, see my review and other reviews here. Q:Does the Samsung have a location base built into the app so that the cameras shut off/on when entering or leaving the premises? Q:Looks like the 1080p is the perfect camera but the price is more than I want to pay. Here is what I am looking for, any suggestions? Q:can i save the video or photo on my smartphone when i am away from home? Q:Will this camera work off a Verizon Jet Pak hot spot? Q:why do i get a notification on my phone that there was motion detected, but when i try to connect to my camera it’s disconnected?! it’s so annoying. Q:Sounds like a great cam for those who wish to stream at 1080p, but don’t mind the low resolution recording. What is the recording quality on this cam? Q:Can you download the videos from the SD card to your PC? if so, HOW? Q:Setting up a camera in a new location. It will be a different router/ISP combination. Will I be able to access this via the same Smartcam ID ? Q:I live in Thailand and our electricity here is 220v, will it work? Q:Possible to record on a NAS? I have TrendNet and Synology equipment; could throw a decent Dell laptop w dead LCD display for control purposes. If not this IP camera, which? The motion detection pictures are connected to Picasa in order to preserve as much space on the microSD card for video recording purposes. There actually is no way as of yet to store the pictures on to the microSD. Q:Why does it log out after a few minutes of streaming video? Is there a way to avoid this, so I don’t have to log in or click every few minutes? This should definitely not be the case when viewing the video stream. We’d like to offer you more help with the product. Please contact our point person for this product at daniel@soltechsecurity.com for further assistance. Q:Can you turn this camera off from your Smart phone? I’ve had the camera for about one week and have also read the guides. I don’t think you can turn the camera’s power off from your mobile device. Q:can you run power over Ethernet on this camera?? No, it has to have it’s own low voltage cable plugged into a 110vac outlet. The ethernet cable is just to set it up. Q:how can i access videos on the SD card remotely or copy them on network. i physically won’t be there for 1-2 years. The videos themselves cannot be downloaded via the website at this time and point. You can remotely view the recorded footage from the website and app, but you will not be able to download the actual video footage from a remote location with the software provided. Q:No email alerts. Google account setup, picasa motion events snapshots uploaded, everything checked and verified, yet no email alerts. Ideas? To setup the email alert, you have to use the web browser. Login to samsungsmartcam from your computer browser. Go to the camera setup page –> Alarm & Notification. Make sure the motion sensitivity is check and the Google box is checked. Under Google section, make sure to have your gmail ID and password entered since the camera uses the gmail SMTP server. Make sure the send alarm box is checked and enter the email address below and click on add. Once the email address is displayed, you have to click on save button. Hope this helps. Q:Will this camera work with the Synology Surveillance Station? It seems like yes, although Synology Surveillance Station documentation does not explicitly list it. According to Synology WIKI, “http–forum.synology.com/wiki/index.php/How_to_use_Surveillance_Station”, you can set up a generic IP camera. 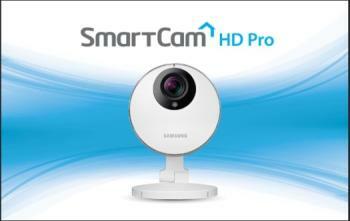 For this Samsung camera and most Samsung IP cameras, try following settings — HTTP Port = 80, Device Port (Or, Media/Video/RTSP Port) = 554, Login ID = admin, Login Password = (Your Camera Private Key when you registered your camera with at samsungsmartcam dot com, i.e., when you first set up the camera), Stream URL or Source Path = /profile5/media.smp. Disclaimer — I do not own Synology Surveillance Station. But it seems this camera might work fine. No. This unit is indoor only but Sandung does make a unit for outdoor use. SmartCam HD Outdoor. Q:Does this camera really “ding” every time the wireless connection is interrupted? Is there any way to turn that off? The camera itself doesn’t ding or make any noise whatsoever. The only time it will make noise is when connected to speakers and prompted to make noise either by 2-way sound or the lullaby options. Q:Is anyone else having problems trying to set this up to send emails? I can’t add my gmail at all. Won’t save settings. You need to change the security on your gmail. The gmail is blocking the app from logging in. Q:I heard once my internet goes down and comes back later, I’ll have to reset the camera online again, why can’t it reconnect automatically? If your internet connection is interrupted the camera will go offline and a blue light will be displayed (when it is online it displays a green light). Q:There are so many complaints about the camera disconecting from wifi, which I intend to use. Has this problem been resolved yet? no use if it has not. Unfortunately, the problem persists. There have been several firmware upgrades since I purchased the SmartCam HD Pro, but it still drops the connection on a regular basis. In fact, I purchased a WiFi extender to ensure the signal was strong enough in our apartment. The signal is strong, but it still periodically drops. I would not recommend that anyone use this as their sole source for baby monitoring. Q:can you view the camera on my android based phone and my iphone at the same time? I think you can as well. I tried to view my Samsung SmartCam camera using my macbook pro laptop and android smartphone at the same time and it does not log me off on any account. You can also put password on your camera if you want it to be private. Just make sure you have fast internet connection. Any more questions feel free to ask me here. Q:How do I view saved motion clips on my pc? I can see them on my android phone. Log in to your Samsung SmartCam account, and click on “Playback”. Then select your motion recording criteria, and move the slider to a green area, and click the play arrow. Q:There’s a piece of magnet clasp in the box, anyone knows what’s that for? This is a ferrite core which prevents frequency interference to the camera. Found it impossible to know how to attach it from the written instructions. Q:Does this camera work outdoors? I have a veranda and I can install it under the roof, on the ceiling very easily. Q:Does the two-way talk feature work via a pc? You can only use the two-way talk feature via smartphone. It is not available on the PC. it doesn’t have to be plugged in. It’s just an option you have when you are setting it up. 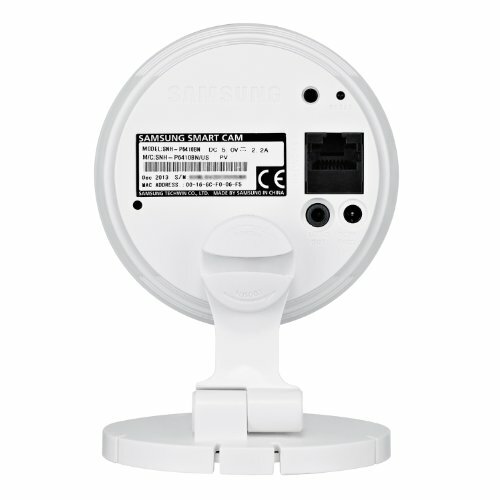 You can set it up wirelessly with your mobiile phone once you’ve downloaded the samsung application too. Q:How flexible is the time scheduled recording? Can you record from 3:00pm – 4:00pm? How small can the time recording interval be? Q:If I mount this camera up high in a 10′ x 12′ room, will I be able to see most of the room? They make it easy. Setup could be tricky–you have to teach the camera how to connect to your wi-fi network and the app needs to find the camera from anywhere in the world. You download the app to your phone like any other app. You can create a Samsung account using the app or at samsungsmartcam.com. The app has a setup wizard that finds the camera and connects it to the wifi your phone or tablet is using. I had no problem setting up in about ten minutes. Q:I’ve attempted using a wireless baby video monitor before and it caused major interference with our wireless router. Would I have the same prob? Baby cam’s typically are wifi unaware, meaning they will cause interference. They have no way to work cooperatively with Wifi on the same channel. Samsung is Wifi itself, so it is wifi aware, and will not cause interference, outside of the normal bandwidth consumption of course. Q:I have inserted a SanDisk SD XC 64GB card in the camera but the camera is not detecting the sd card. Can someone please help troubleshoot this issue? Ensure that the card is formatted FAT32. Q:Does the IR LED emit light, or invisible to the naked eye? Q:Can you upload motion detected event VIDEO to google drive? No consistent answer, or different models seem to support and others not? Q:Has anyone used this as a baby monitor? If so what do you think? This is quite an odd occurrence as you the quality setting should stay as is even after you log out and log back in. I’d recommend trying a different browser and see if that helps. We’ve tested it here in the office and in most cases, we’ve seen that the quality setting consistently stays on the previously set setting. Q:One of the other camera makers software/website show’s you a timeline displaying where there was activity or not in the history. Can this do that? When the cam is set to record only when motion or sound are detected, the segments of time where a recording exists are shown in the timeline with green highlighting. You can then drag the playhead to one of these highlighted segments of the timeline and play back the segment. Cueing exactly to a certain time point is not possible, but you can get within ten or twenty seconds of where you want to start watching. In order for the snapshots to be there, you’ll have to activate your picasa account in the camera settings. Since video/image storage isn’t done on the Samsung server, the images actually are pulled from Picasa and shown on those boxes when you have it set. Q:Do you have to take out the sim card to see the record file? or it can be view on internet over your phone or computer? You can view both live and recorded file over phone or computer, no need to take card out. Q:Has anyone had problems connecting to WIFI?? I had problems connecting to any Apple router. Has to do with the type of security that each device uses. Once I switched to a non-Apple router, I had no trouble. I don’t have any wifi issues with this camera. Q:Got a question. When the power goes out, and comes back on, does this system reset itself ? Without any manual intervention ? Q:Can you rotate the samsung camera and change the viewing angle remotely using an iPhone? Not phone…I meant to say the camera does not rotate. Q:Does the camera support uploading image or video to FTP server? It is difficult to set up with that aspect as is it with all other aspects of this camera. I logged in and could not get it going after following instructions, etc., so after an hour, I realized it was the system/camera and not my problem. No longer uploadable to Youtube as advertised, either, as per my review. For the same price of hardware, I returned this and bought DropCam for 199., which is excellent and has server online for a monthly fee. Dropcam is much better in every way. Q:Can you control more than one camera from the APP? Yes, the app allows you to associate multiple cameras. Q:Do you need an adaptor for the micro SD card? No. Micro sd goes in directly. Q:Will this camera work with only a WiFi signal & Internet connection? There will be no PC available after setup. Yes. I set mine up with an iPad using my Wi-Fi system and access the camera using either the iPad or my iPhone. Setup was fairly easy. Q:Other than plugging into the electric outlet, does it have an option using lithium battery instead? Q:Do I lose my wireless settings, etc., if power goes out? Q:Does it come with a SD card? I see the same camera from the same company at the same price on Ebay that comes with a 32GB Samsung SD card. No, it does not. Apparently you can insert one though. You can save images from the camera onto whatever device you’re using though, whether it be your phone or computer. Q:I am getting this message. “Access has failed. Please try again in a moment (simultaneous connection/network unstable)” Help is appreciated. First make sure your internet is up and running by simply opening up a browser. If yes, check to see if your indicator light is green on the camera. If the light is another color then unplug the camera for 10 seconds and plug it back in. If after 3 minutes or so it still does not work you may have to hit the reset button on the back and go back through the setup process. None of your save videos will be impacted. Q:Is there any way to adjust frame rate? I’d like to get 30+ fps to overcome the non-transmission related delay. There is no way to actually adjust the frame rate at which the recording or streaming is done. The most that can be adjusted is the network speed (video quality) at which the video is seen from either the phone app or the website. Q:It seems like it is only uploading still images to google. Is it possible to upload video? I have not tried to upload video, yes it should be possible even if you removed the memory xard and went straight from it. Or chose your phone as the recording device. Q:If I upload images to google, can anybody in my google circles view images? It appears that’s the case, but I can’t tell for sure. Ye . Make sure the WDR feature is enabled in the settings. Also, if the IR LEDs are on at night time, the glare from the window will impact the viewing.